Once again, this month's shot is at Llandudno Junction. This time however, we are at the western end of the layout, and passenger coaching stock fills the viewfinder. The picture was taken on the 27th March 1978 - Easter Monday - and it was another busy Bank Holiday weekend for railway staff at Llandudno and Llandudno Junction. 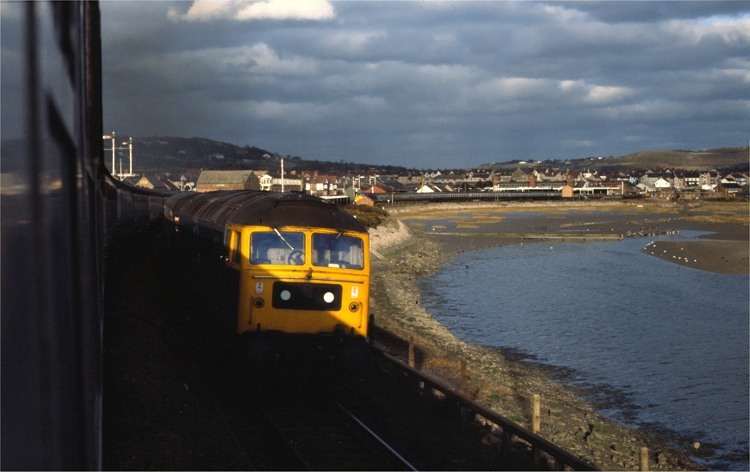 The photograph was taken from a Holyhead-bound loco-hauled train as it climbs up the causeway towards the Conwy Tubular Bridge. Shunting in the sidings are two other loco hauled rakes - in the foreground a class 47 is standing on the Conwy Quay siding, having shunted out of the way for a further Class 40 hauled set to shunt out of the station sidings prior to reversing into the carriage shed. This 11 coach rake is visible in the distance. Also stabled at the entrance to the Quay siding is a rake of ballast wagons. Empty coaching stock was always a feature of Llandudno Junction at this time. Even in winter, coaches would be stored in the carriage shed, and around bank holidays and during the summer, sets would be parked on the Quay siding or in the up refuge siding on the other side of the main line. The Quay siding remained in railway use long after boat traffic had ended. The line ended in three sidings, and these were used for stabling P.W. wagons or coaching stock. The buffers were very close to the river, and on one occasion a coach ended up in the water after a shunting mistake. Later the end sidings were removed and the buffers moved towards the station.